Want to enjoy your iPod music from your home stereo system without compromising sound quality? And without wires? 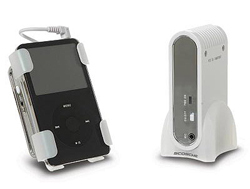 The Scosche IUBHK Bluelife Bluetooth Wireless System allows you to listen to digital CD quality music from your iPod or MP3 player without wires! It’s Bluetooth 1.2 compliant, provides up to 15 hours of battery life and delivers clear, interferance free digital quality sound from your iPod up to 30 feet away! This Scosche IUBHK Bluelife Bluetooth Wireless System comes with all the essentials including Bluetooth Receiver, Bluetooth Transmitter, iPod Cradles, MP3 player soft case and power adapters, so you can experience the ultimate in wireless sound! Simply link the Scosche IUBHK Bluelife to your iPod and listen to your own music collection from anywhere in your home! Pick one up from X-Treme Geek for only $59.95. Includes iPod cradles, MP3 carrying case and more! Bought Scosche Bluetooth Received with thoughts of using with high quality PC speaker sound system to play music in living room coming from PC in nearby office. Have Bluettok USB adapter in PC, but cant’ seem to direct music form PC to the Bluetooth Received. AM I missing a step? Shouldnt the Bluetooth USB transmitter (Belkin) show as an option in the WIndows Speaker selection?